Can you imagine a baby girl more adorable than yours wearing our Mary Jane shoes? 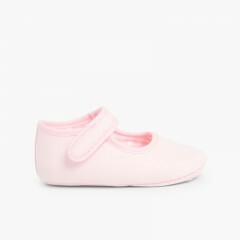 They're so lovely and cute that they have become mum's favourite baby shoes due to their design, variety and quality. You'll be the envy of everyone at the park, nursery school or wherever you go with your baby. Try to buy just one pair... you'll find it really hard to do. You will love all our range of Mary Janes styles! Our whole shoe store is designed to cover all your needs all the year. At our baby prewalker shoes section, you will be able to find australian style boots, chukka boots, lace-up Oxfords, Condor textiles... at the cheapest online prices. If you have a baby or are expecting one, this is the right place for you! Pisamonas is your online footwear store. Enjoy your purchase! I will use the shoes for my daughter to attend a wedding but also for a general days... are lovely. The quality it’s very good also. Seems very comfortable and is very pretty at the same time.